Mama hints to Marco about a big surprise in the Memorial Day parade and as Marco encounters each exciting section of the parade, he attempts to guess at the big surprise. The fast pace as the pair hurry to the parade along with the rest of the crowd adds to the excitement. 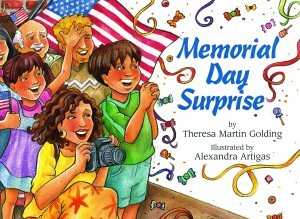 After they pass Abuelo’s (grandfather’s) house, Marco asks his mom what “Memory Day” is, and while she corrects him, she says memory day is a good name also because, “It’s a time to remember some special people.” Although a simple answer, it is an appropriate start for a young child and the author focuses on the exciting parade that honors U.S. soldiers. 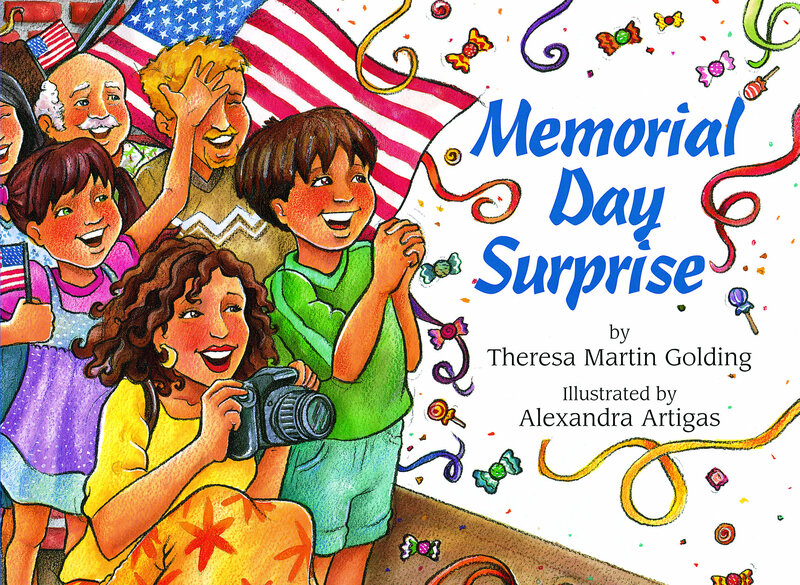 Theresa Martin Golding and Alexandra Artigas create a book portraying positive emotions and excitement behind a holiday which may typically have little meaning to children. Even adults may forget that the holiday is about more than a day off of work or the start of summer. The full and colorful illustrations support the festive, exciting mood in the story, and the mystery of the big surprise can keep little ones in suspense. It seems to be Marco’s first parade as each parade element is seen as such a novelty. I love that kindness is emphasized in Marco saving candy (unfortunately not vegan but the only reference) for his Abuelo and thinking of him when he sees impressive things at the parade. A part of me felt that it glossed over some important details such as Memorial Day usually honors the U.S. soldiers who have died. It was known as Decoration Day in the past because people decorated U.S. soldiers’ graves. In this book, there were no references to those who had died, but honor was given to those who were still alive. Death is a difficult issue to broach in children’s books and would completely march over the exciting, celebratory feelings of the parade so it is understandably absent in this story. Nevertheless, It would have been nice to have an educational page at the end of the story detailing more information about Memorial Day and the soldiers who have served such as the different wars or different memorials, monuments, or cemeteries families could visit.